“The reason I love trial work is because no matter how complicated lawyers try to make the law, when it comes down to it, it’s about connecting with people. Yes, you must know procedure, you must know how to get evidence in, but in the end, it’s about presenting your story to 12 regular people you’ve never met. This simple system works,” says Daryoosh Khashayar, founder of Khashayar Law Group, with offices in San Diego, Vista, and Beverly Hills. Khashayar certainly knows how to tell his clients’ stories to juries, as evidenced by the staggering $61.587 Million Jury Verdict he obtained for his client in Asbaghi v. Nydegger. The case became the top jury verdict in San Diego in 2016, along with being the #5 largest verdict in California, and the 22nd largest verdict in the nation that year. It remains one of the largest single case verdicts in San Diego history. 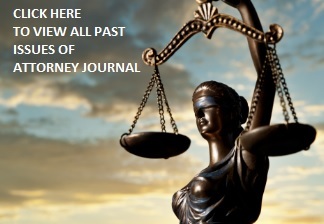 So how did Khashayar become one of the most lauded trial attorneys in Southern California? To hear him tell it, it all began with a speeding ticket. He went on to attend the John F. Kennedy School of Law, before being admitted to the California Bar in 2005, and subsequently heading south to Southern California. “My cousin Bob Semnar was working in Southern California, and asked me to join him and open our own office, and I dove right in,” he says. In addition to Semnar, Khashayar says that Robert Hamparyan in particular was a source of constant encouragement and support as the young lawyer began building a name for himself as a fearless trial attorney. “I could call Robert at 11:00 at night, and he would help me,” Khashayar says. “The legal community here supported me right from the start,” he adds. Khashayar’s eagerness to take whatever opportunities he could to gain trial experience, also led him to the Office of Assigned Counsel, where he began defending those accused of misdemeanors. Ranging from drug, and DUI cases, Khashayar would wind up defending felony charges in virtually no time, and to the success of his clients. One criminal case in particular stands out to this day. “The father of a young pre-med student hired me, after his son was accused of hitting someone with a bottle at a Halloween party. He was facing felony assault with a strike charges, and the DA went after him. I was able to prove that it wasn’t him and the case was dismissed. I still receive flowers from my client for proving his innocence,” Khashayar says with a smile. Although he is driven to secure the largest compensation for clients as possible, as it’s often the only form of justice for wronged individuals; he’s also driven to make sure justice is served even in cases which aren’t going to break records. Cases which are close to his heart are equally rewarding, as evidenced by a personal injury victory earlier in his career, which he still counts as one of the most rewarding cases of his career. “I was called in to help on a case by Bob Semnar. It was the case of a little girl in Contra Costa County who had her arm broken. Her previous attorney was going to settle the case for $7,000 when we took over. She had a few thousand dollars in medical expenses, but we knew her pain could last for years. Everyone said we were crazy to take the case to trial, because it wouldn’t be a high-value case, and we could lose. But you never know when you put the case before 12 people,” Khashayar says. Accumulating such victories is clearly what drives Khashayar to continue fighting in courtrooms for his clients. But, it was the stunning victory in 2016 that would cement his position as a trial attorney that no company nor insurance company wants to face in court. In Asbaghi v. Nydegger, Khashayar was called in after the plaintiff had spent two years with a malpractice attorney, and needed a formidable trial attorney. “The plaintiff called a colleague and friend of mine from the Bay area—Kambiz Adibzadeh—for a referral. I became lead trial counsel, with Kambiz Adibzadeh as second chair,” Khashayar says. The team represented the plaintiff in the breach of fiduciary duty and legal malpractice case, wherein his client’s patent attorney failed to renew the patent fee on a unique dental device. Consequently, the patent was abandoned. Khashayar had the case for just five months, before it went to trial in early August 2016. “My client had asked for the policy limits, but the final offer was only about $200,000. Since we had asked for the limits, when the jury delivered its verdict in our favor, the insurance company found themselves obligated to pay. We asked for the limit, they kept saying no, so we took it to trial and they wound up taking a huge hit,” he says simply. That case has been transformative to say the least, as Khashayar’s success in the stunning victory, put him in the Top 50 Verdicts of the nation. Suffice it to say, he’s been invited in on many cases set for trial as the result. “There are a lot of great attorneys in San Diego, and throughout the state, who don’t have a lot of trial experience. I do have a lot of experience in trials over the past 12 years, and I love being in a courtroom,” he says. Other significant victories for Khashayar’s clients range from a recent $1.25 Million Bad Faith claim against a title company for wrongful denial of a title insurance claim. In Landmark Lending v. First American Title Insurance Company, Khashayar and his team secured the full award of $1.25 Million after the claim was denied, and legal battles waged on for years. Other significant wins include those dealing with Securities Fraud, Breach of Contract, and Personal Injury. “Our firm is set up with the goal of trial,” says Khashayar. “I personally meet and work with all of our clients, so they aren’t pushed off onto a secretary, or a new attorney. I handle their cases.” However, thanks to his incredible successes, Khashayar is now able to be selective about the cases he takes, and says that his firm abides by a quality over quantity mentality. “I don’t take cases just to take cases. We don’t have more than 40 cases at a time. I’m not promoting on billboards, because we would much rather take 5 good cases, than have 50 run-of-the-mill cases,” he says. This is by design, as Khashayar says, “When clients hire us, they are not getting settlement attorneys. We devote 100% of our attention to that client. We are aggressive trial attorneys, and we get bigger and better settlement offers because I am always willing to go to trial. We are not afraid of going to court, because when we go, we are prepared. I know every single piece of evidence, I know every single witness, and I know that defense firms are going to try to scare me by filling me up with paperwork. I expect it. But if I had a nickel for every time I’ve been told by defense attorneys or mediators that I would get nothing more than their offer for my clients, and I should take it and run, I would have too many nickels to count,” he says. With all the success of its litigation department, which is largely devoted to business litigation, Khashayar Law Group’s Transactional team is certainly a formidable division as well. In fact, the transaction team at Khashayar Legal Group took over the reins of what was formerly LOKK Legal. “LOKK Legal was my younger brother, Koorosh Khashayar’s law firm (Law Offices of Koorosh Khashayar). He passed away in September 2015 suddenly from a seizure,” Khashayar says. Though the sudden tragic loss obviously left his family shocked, Khashayar has done what he can to not only honor his brother, but to help raise awareness and research funds for epilepsy. Lokk for Epilepsy (www.lokk4epilepsy.com) is dedicated to “raising funds and awareness for epilepsy research,” says Khashayar. “My brother was a pillar of the San Diego community and a successful young attorney who worked hard to help people in the community. He volunteered his free time to feed the homeless at the Urban Angels in San Diego, and walked 60 miles to support the Susan G. Komen foundation’s 3-Day walk for breast cancer awareness numerous times,” he adds. Continuing he says, “This foundation is our way of honoring Koorosh’s commitment to helping others. He had lived with epilepsy since he was 17, but did not want any sympathy. He was full of life, and we want to do what we can to ensure that the frustration and loss we have experienced doesn’t affect others,” he says. Khashayar further honors his brother’s memory through maintaining a robust contract law department, where he continues to work with many of LOKK Legal’s clients. As Khashayar Law Group continues to grow, with offices throughout Southern California, and a strong presence in Khashayar’s native Bay Area, he intends to stay true to what has been key to his remarkable trajectory of success thus far. “Our business has grown by word-of-mouth referrals from past clients, and from attorneys who call us in to try cases. We welcome these opportunities as trial work has been my passion from the start,” he says. As for when Khashayar isn’t busy advocating on behalf of clients who have been wronged, or keeping the firm’s transactional department running like a well-oiled machine? He says that there’s no way he’d rather spend his time than with his family.